US BITs and FTA Investment Chapters: A Vital Tool or Outdated Relic? 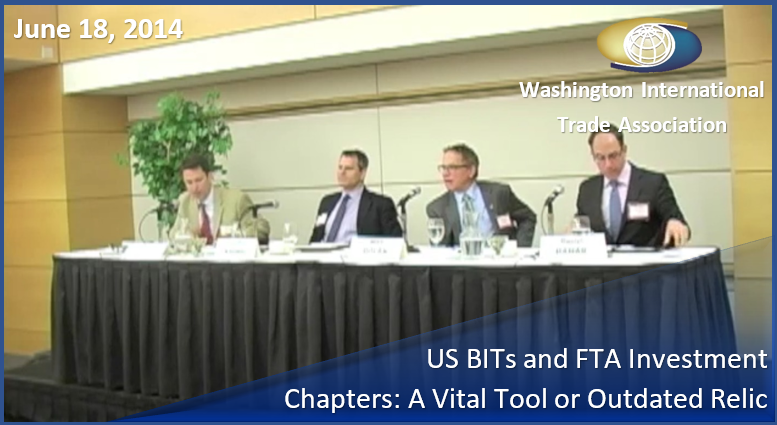 Event videos > US BITs and FTA Investment Chapters: A Vital Tool or Outdated Relic? Do you want to know more about bilateral investment treaties and the investment chapters of US free trade agreements? Do you want to understand the Obama Administration’s investment negotiating objectives in Trans-Pacific Partnership, the Transatlantic Trade and Investment Partnership and the US-China BIT? Then come hear from WITA’s panel of investment experts, including Deputy Assistant USTR Daniel Bahar, on Wednesday, June 18, at 9:00 a.m. Since the early 1980s, the United States has negotiated bilateral investment treaties (BIT) and free trade agreements with BIT-like investment chapters with more than 50 countries. These agreements seek to promote cross-border investment between the United States and its treaty partners by establishing international standards of treatment for such investment, including protections against uncompensated expropriation, nationality-based discrimination, trade-distorting local content requirements, and arbitrary or inequitable treatment. Today, the United States is negotiating agreements to expand this network of investment rules through the Trans-Pacific Partnership, the Transatlantic Trade and Investment Partnership, and the US-China bilateral investment treaty. These agreements will govern the treatment of hundreds of billions of dollars of investments and shape the course of US and global investment policy for decades to come. As a result of these negotiations with several large and important economic partners, a familiar debate around US investment agreements has once again emerged: Do investment agreements appropriately help US firms access foreign markets, increase demand for exports of US goods and services, and contribute to a rule-based economic system, as supporters argue? Or do these agreements interfere with governments’ right to regulate, allow businesses to assert frivolous claims, and mitigate political risk that business themselves should properly bear, as critics allege?